Alexandre Munz spent 4 full weeks on BYU campus teaching his groundbreaking somatic system and the science behind the program. The program, called the S.A.F.E. (Spine Advanced Function Empowerment) Project has which has been endorsed by the French Minister of Culture and taught all over Europe, but had never been taught in the United States before this project. BYU was the first entity in the United States to be able to learn from Munz’s research, which placed the university on the cutting edge of artistic innovation and new methodologies and strategies in dance. The dancers in both the Dance 490 and 391 courses were taught the somatic system and his S.A.F.E. Barre work for ballet technique. Dancers in Dance 498-­‐1 (BYU Theatre Ballet) learned and performed the new choreographic work that he created on them. Additionally, a dance education student was able to be mentored as we produced and created an instructional DVD of his somatic practice which is currently selling to a global audience on the BYU creative works website (http://creativeworks.byu.edu/catalog/ViewItem.aspx?item=DA002) and the official S.A.F.E. Project site (http://www.thesafeproject.net/store/shop.html). The mentoring environment for this project was more individualized for each student than we had originally anticipated. Each participant was able to work with Munz one-­‐on-­‐one on a daily basis throughout the month that he was here. Because the training program is unique, it was important that the students each be coached individually as they executed the movement. This was necessary for full physical realization of the research Munz presented, and so that injury could be avoided. 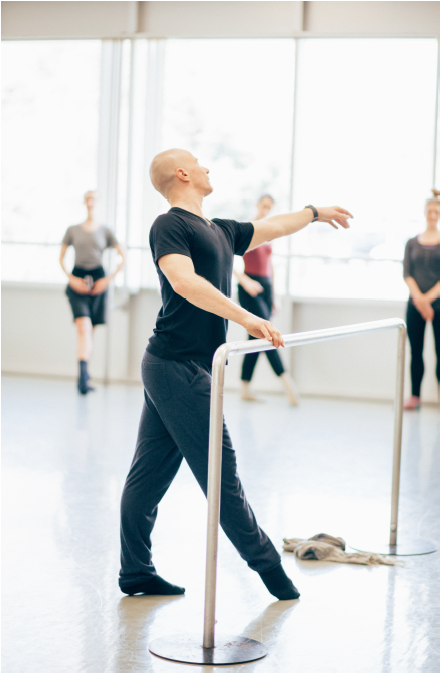 Additionally, the BYU Theatre Ballet performers worked closely with Munz in a highly individualized learning environment while he created a new choreographic work using techniques used commonly in Europe. Each dancer was expected to contribute to the information being generated. Each dancer also received personal feedback. Before coming to BYU, Munz had spent the past 10 years developing this system throughout Europe, working with over 31,000 participants. Since the creation of this instructional DVD, his work has achieved a larger, more global reach. We produced the DVD in English with the option to play it with voice-­‐over in Spanish, Portuguese, Italian, Japanese, Mandarin Chinese, French and Russian. Department of Dance faculty membe, Shayla Bott, served as the demonstrator for the DVD. Bott, Robison and Munz have all received positive feedback and requests for future instructional products. Munz’s choreographic work, Virtues’ Oddity, was performed in November, 2014 in the Dance Studio Theater in the Richards Building and in January, 2015 during the “Fairytales and Fantasy plus contemporary progam” in the Pardoe concert hall in the Harris Fine Arts Center. Munz’s work influenced not only the dancers that he worked with directly. The new company members who joined BYU Theatre Ballet in the Fall of 2014 were able to learn and perform his unique movement vocabulary. The company received an invitation to perform the work in Paris, but due to the timing of the performance, was not able to travel and perform. While Munz was on campus, we also organized workshops for the local dance community to learn the S.A.F.E. Barre and somatic practice with the students acting as demonstrators. Additionally, Munz gave a scientific lecture on the biomechanics involved in his system to Department of Dance students, faculty and athletic trainers, as well as other scientists on campus.